It's a milestone towards which every parent strives: The day when they'll finish buying diapers or nighttime pull-ups for their child. With this milestone comes passage into an age of maturity and responsibility for the child, not to mention a welcome reprieve on our bank accounts. So what happens if that time seems never to be coming? What if your child has long ago passed his 5th or 6th birthday, and he is still not getting through the night without accidents? Or what about when he hits the double digits? You've already asked the pediatrician what to do seemingly countless times and were told to simply let the child grow out of it. But how long should you wait before taking another course of action? Parents come to me all the time after having listened to their family doctor and waited. But when your child is suffering from heightened stress, frustration, and embarrassment, why should you merely wait? Why add months or even years of distress to his life? As a parent, I was once confronted with just this situation. My son, at age 6, was still having accidents at night. Completely dry and able to go the whole day without any incidents, nary a night went by when we didn't have to change the sheets. We were exhausted not only because of the middle-of-the-night housekeeping duties, but also because, as much as we tried, we couldn't find any real solution for his "problem." Our doctor sent us for many tests: blood tests, urine tests, you name it. But nothing yielded any results. The reason? Because in nearly 99 percent of children facing bedwetting, nighttime accidents are not a result of a medical condition. Bedwetting may be the result of a learning fault of the brain's reflex system that occurs when the child is in a state of very deep sleep. These are otherwise healthy children who, through no fault of their own, aren't capable of recognizing the signals that the bladder is sending to their brains. It pains me when I hear of children who are being punished for bedwetting, made to change their own wet linens to "teach them a lesson" with the intent of forcing them to learn to wake up and go to the bathroom. Confronting this ignorance requires that parents become educated and effectively assist their child in overcoming this condition. Within pediatric medical circles and the parenting community there is an overwhelming lack of credible information and resources available to those parents who are desperate to do something. Commonly repeated "helpful hints" are often wrong and can even be detrimental to the child. For example, I bet you've heard that you should take your child to the bathroom before you go to bed yourself. But by doing this, you're taking the responsibility away from the child, and he will fail to train his brain to recognize the necessary signals. There are people, myself included, who have a focused practice to fix bedwetting. Safe and proven methods have already treated millions of children around the world and are available to the millions more who are still suffering. Educate. Knowledge is power, and it will help guide whatever decision you make. Do not ignore the problem. The condition exists, and your child needs to feel that he has a support system. Be available to your child. He is the primary sufferer of this whole ordeal and needs to know that he is not alone. Show your child information available online about other kids who have been dealing with this problem. 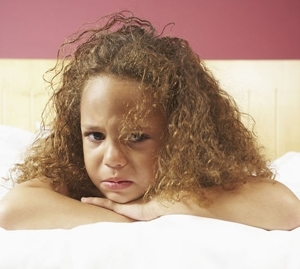 Let him see that there is nothing wrong with him, and that bedwetting can be overcome. Don't compare your children. Highlighting that a younger sibling is not having accidents just makes the affected child feel worse. Seek professional help when your child shows concern for the condition. Dedicated bedwetting clinics and online resources are available for exactly this purpose and have safe and proven treatment options. About the author Jacob Sagie, Ph.D.
Jacob Sagie, Ph.D., is a world-renowned enuresis specialist and founder of several bedwetting clinics around the world. His 30-year career dedicated to treating bedwetting has lead to the development of TheraPee, an online tailored bedwetting therapy treatment kit that mirrors his in-clinic techniques.